Shirdi Sai Baba Stories,Leelas and Teachings. : Shirdi Sai Baba's Grace-Experience Of Sai Devotees-Part 32. Experiences of devotees are pouring in everyday with an intent to be shared with all .Each one of these narrates the benevolent Sai Baba's love and care for His children .A child may forget his mother but a mother can never forget his child .How can Baba leave his children alone when He has promised of staying always by side of his children and looking after their welfare. If the chid is ignorant and blindfolds himslef to think a day as a dark night it is the mother who will guide him to light and show him the right path .Our Baba is our loving mothing guiding,protecting and taking care of us .Having found the form of live God in this Kalyug how can Baba's children be in tormoil of this wordly afflictions? Below are few experiences shared by devotees which carry the same emotion . Jai Sai Ram . Manisha Ji this story is actually highly private and confidential I was unsure about sharing my true story but I want all Sai children to know that in a life and death situation only Baba can save us and nobody else. I would like to share my experience related to my career which almost made me crazy last year. I am still having the honour as an officer in the government is due to our Baba no one else. Let me tell you all about myself. After completing my post graduation, I was jobless. The only job I finally got is as a government officer (Sorry I could not reveal my exact job and post since its confidential, I hope u will be able to understand my situation). This is not what I wanted in my life since I just wanted a simple job which is not so complicated. But I understand this was my destiny which I can't run away from. For about few years I really enjoyed doing my job. Unrealising I became very competent in my job. Being young and as female, I am capable of handling even a man's job. I have no fear in me since anything I do or I sign i pray to God first. I was very nice to all. Trying to be friendly with all staffs. Unfortunately my capability in my job made others to have hatred against me. I started realising the number of enemies I had started multiplying. Even the ones who I cared so much and believe also became a back stabber overnight. I am not lying upon Baba I say I came to a point where I was surrounded by wicked people. I even feared eating or drinking whtever others gave (I believe you all can imagine what type of people I am dealing with). Daily at work I try to give more than the salary I get. Since I believe Baba always observe us and we must do only good even if others do bad. Things became worst until 1 day I was fixed up by all senior officers. I didn't do anything readers, I was sincere in my job that was my mistake. Since I am still single i get great satisfaction completing great task. My parents were supportive. Can you all believe many senior officers against me?? ?Upon Baba I have a clean record. No one can find fault with my work. I even help others complete certain task even they hate me. At last those evil people started a big game to fix me. Firstly they disturbed me when I was officially on leave, then they start using my name saying that I told this and that. Finally they issued false charges that I didn't co-operate in something (I am again sorry readers since I can't reveal the exact reason). Being a sincere worker 1 fine day I was given a show cause letter for some false charges. Even one person said all are against you, better you transfer somewhere. After that, I left that work place heart broken,I told my problem to a very reliable superior and was placed at head quarters. Baba guded me since I was like a mad person. I kept my faith in Baba stronger ever. I almost resign I even told this to my superior who stopped me. I told that person they are making me mentally sick. Sorry to tell you all at 1 point in that period i felt like almost falling to death from a high rise building because I can't prove my innocence. My best friend hold my hands tightly and said dont do stupid things. That time I even said Baba why me.Didnt't I trust you always. Why me? Why all against me? I never stop praying to Baba although my situation was horrible. I felt like Baba told me ,"Don't give up. You will go back to that old place with honour. Never give up". Baba was true, a month later I was requested to go back to my old place with order by the Director after all superiors discussed about it. I was referred to as a skillful officer and my service is greatly needed. The false charges were proven unreasonable. At last I went back and my superiors all kept an eye on administration aspect to make sure I am safe. What else I can say. Now you all know how great our Baba is. All my enemies were scared and shy to see me. They were also advised by superiors. I strongly believe I will not die if Baba is with me. Daily at work I see miracles. Many things changed. I always pray to Baba before I make any formal decision. I am so debted to our Baba. I will visit Baba in Shirdi when Baba permits me since the life I am living now is all by his grace. Love you Baba from the bottom of my heart. 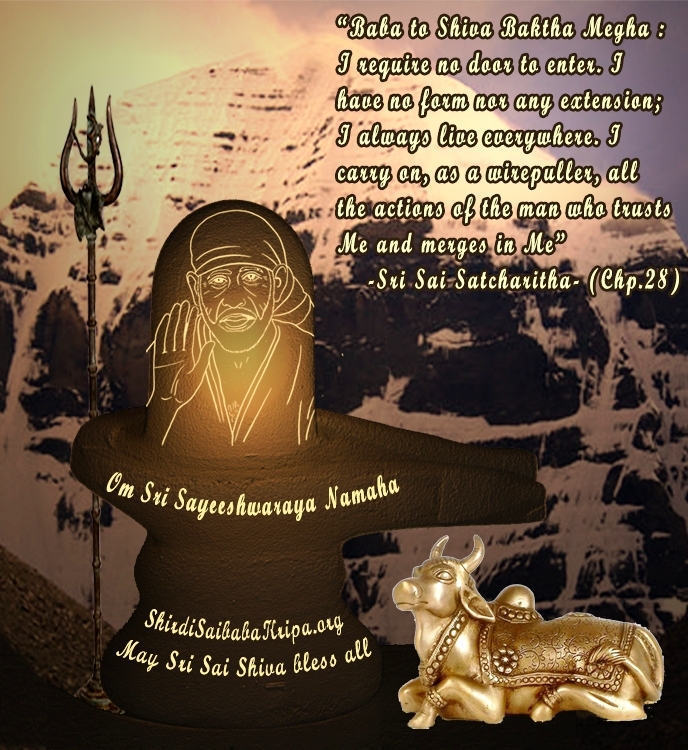 Please bless my best friend who is always with me, bless her and also all your devotees. 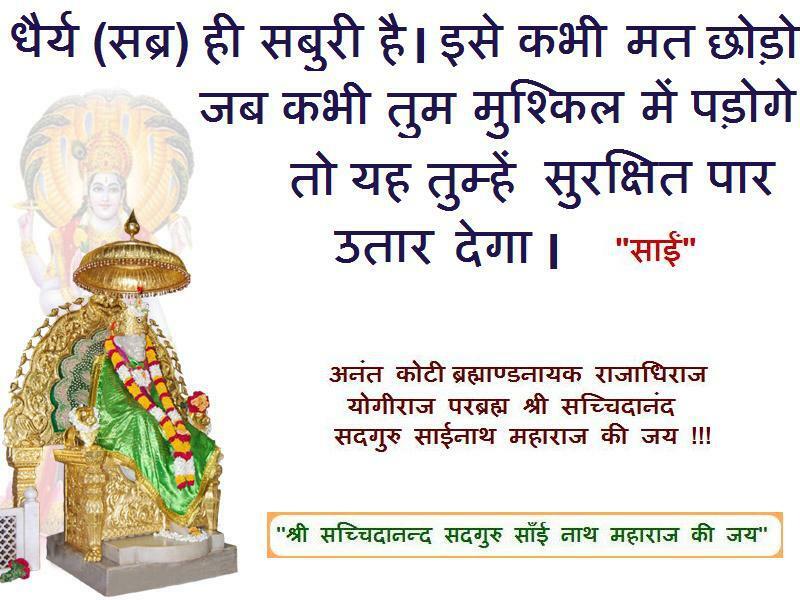 I believe I have done my duty to Baba by sharing this truth since at first i hesitate to do so. Please remember though you feel like ending your life, remember Baba pause for few minutes. He will help. JAI SAI RAM. VICTORY IS ALWAYS WITH BABA'S TRUE DEVOTEES . December 22, 2011 to December 26, 2011 , kind Baba set me for a visit to HIS house at Shirdi which I call my “Baper Badi ” in Bengali meaning “Father’s House” or commonly termed as “Maika” in Hindi. With me was my 19 month old baby girl , Doll (Saina) and her nanny (Sumitadi). I am devoted to HIS worship since a tender age by HIS blessings. Since I had told Baba that I would marry only a Sai Bhakt and none else, HE was kind enough to see that my husband , who was a Bhakt of Goddess Kali , and did not hear about Shirdi Saibaba till then, got totally converted to a Sai Bhakt before our marriage. Today, I can proudly say, he is more Sai’s than Sai is mine. Since Sai is our Baba(husband and mine) , we have taught our daughter to call HIM ‘SAIDADU’(Grandfather), which she does. She plays with Baba’s idol at home. Wishes HIM ‘Good Morning Dadu’ on waking up, helps me give HIM a ‘bath’ , feeds ‘HIM’, helps me ‘dress’ HIM up, claps her hand during ‘Aartis’, sings HIS ‘bhajan’ so on and forth. Doll also snatches Baba’s head dress and plays with HIM. This is a brief on our daily house chores. Now, coming back to my ‘Maika’ or ‘Baper-Badi’ visit to Shirdi. I am sure, all devotees must have faced the erratic behaviour of the security guards inside the temple. Not all are bad, but most of them push the devotees and shun them away as soon as one comes closer to the idol to get a finer look at Baba’s divine form. Devotees are literally treated as ‘criminals or qaidis’…(forgive me if I say wrong).. and for that matter all are pushed.. be it kids or older people. Even , men (guards) push young ladies, women as well as old people with all their might!.Whilst I understand, they too are pressurized on account of the daily crowd, but then where is Baba’s teaching put into practice of treating everyone humbly? I have found these guards lack the ‘patience’ factor despite being endowed by such a noble act of taking care of the pilgrim devotees. I understand mail discussion on the rudeness of the security guard had been brought up earlier but I do not see any progress on their attitude so far. Fine… we came out of the temple and directly fell onto the queue which took us to Dwarkamayee. I was actually so angry with Deva that I wanted to rush back to the hotel as my daughter was hurt… and wanted to cry… !! But no, HE knew we were hurt(deep), so HE put us directly to the queue which took us to “Dwarkamayee”. Inside Dwarkamayee, I complained Baba… How did YOU allow this? Doll loves you so much so do I. Its not about only us .. a question of so many devotees , including older women who are pushed so bad.. What if they hurt their bones?... So saying, I also made a particular statement about Rs 10/- (sorry… am not sharing the exact statement that I told HIM)… so saying, I bowed down to take HIS blessings on the stone where HE used to sit. And what do I see after straightening up?... I had a Rs. 10/-note in hand. “So what do I do with it now”. I asked. With dual mind , I placed the note in the Hundi thinking that the note belonged to someone else who has lovingly given Baba, so I shouldn’t keep it (although I wanted to keep it as I felt Baba gave me the Rs.10/- since I have told HIM something about Rs.10/-). Soon, the security guard rushed to me and asked me “What did you do with the Rs.10/-?”. “Have put it back to the Hundi.” I replied. “Why? Baba just told me that HE gave it to you!” he said. “Really! Well.. actually I was annoyed since few other security guard in the Samadhi Mandir misbehaved with my daughter and me … I was complaining Baba.”… I disclosed all the facts to him. “Perhaps, Baba has send me to you. You wait here with a calm mind and talk to Baba . I am coming back in a jiffy”.. So saying , he gestured me to sit on the Dwarkamayee with my daughter and Sumitadi and he rushed away somewhere. I waited with my daughter trying to come in terms with the happenings and talking mentally to Baba requesting HIM to return the Rs.10/- to me as being a fool I did not understand HE gave it to me and so put it back to the Hundi… Although I know without HIS want nothing can happen and my putting back to the Hundi might have been HIS desire. Meanwhile the security guard returned with Rs.4/-. He told me to give Rs.2/- to my husband and Rs.2/- should be kept by me . He asked us to worship them as directed by Baba. So saying he also gave me few “Chappatis”. I was thrilled. I thanked him and returned back to the hotel. But all the while Rs.10/- was swinging in my mind. Strangely enough!.. I wanted the Rs.10/- from SAI. I kept on telling HIM… “YOU gave it to me. So why did YOU take it away? YOU will have to return it to me!”. Then and the couple of days after, we had nice and peaceful darshan. The last day, was the best darshan. I went for the Kakad aarti (alone). Oh how lovely!!.. I had the pass. I got the passes done through online booking. It is very convenient. For all my stay dates, I had booked one darshan and one aarti daily. I encourage all SAI devotees to make use of the online darshan system which has made Darshan so convenient. Thanks to Baba! Thanks to the Sansthan ! The entire Kakad aarti went on for 1hr 30 mins or perhaps 2 hrs..(instead of the standard 20mins aarti and 30 mins Abhishek Pooja,ie, total 1hr) …as in.. Kakad Aarti , 7-8 Bhajans (Usually only 1 Bhajan is sung.. but lucky me!... I could get to hear endless Bhajans… This happens only on days that the Pujari’s decide to clean adepth all the surroundings of the mandir.) , then Baba’s Mangal Snan, Abhishek Pooja, Shirdi Mera Pandharpur – Choti(small) Aarti.. and finally the darshan queue was released. I could stand for more time without harassment from the security guards. And imagine 2hrs infront of Baba!!! Divine… isn’t it? I thanked Baba telling HIM … “Is it because today is my last day with YOU here that so much blessings!!.. YOU don’t want to let go of me .. isn’t it Baba?”…. Since the Rs.10/- was all along revolving in my mind.. I once again reminded Baba to give me the Rs.10/-. Let me share with all a particular method of Puja as done by me at home (although with the winter advent, I haven’t been able to continue with this routine!) .. I felt perhaps that was precisely the reason HE was kind to me with the Kakad Aarti and the Bhajans. I wake up around 3.30 am in the morning. Have bath. And tune to the Live Darshan from Shri Saibaba Sansthan so that I can also do my regular Kakad Aarti in tandem with the Shirdi Mandir. I give HIM bath in tandem with the Mandir too. And the most heart melting moment during my prayers each day is when the “Bhajans” are sung by the Pujari….. Oh what a feeling!!... You will simply melt whilst you listen to the Bhajan in the Pujari’s Voice (No professional singers voice can match the Pujaris voice, in my opinion) . I have downloaded some to listen to it at my ease and want. I feel so much connected to the Pujari’s voice that I always convey thanks to the Pujari in my mind. This time, Baba gave me the opportunity to thank the “Pujariji” personally for his melodious and honest voice in service of BABA. I recollect, I spotted him amongst the crowd, and how fast I had to run to catch up with him to convey my gratitude. BABA took care of my desire to thank him. And perhaps, it is also for this reason that I call myself lucky that I could get to hear 7-8 Bhajans where only 1or at best 2 Bhajans are sung on a daily note in the mandir. This also elongated my proximity to Baba too in terms of the hours spent with HIM as against to the pushing by the securtity guard for spending even a second more! Oh yes… with all these happenigs , I still had the Rs.10/- revolving in my mind. I felt any moment someone will come and hand over Rs.10/- to me! So saying , I went down for signing the hotel bill. As I bid “Good-Bye” to the counter… I heard a voice call me back “ Madam, won’t you collect your Rs.10/-? With utter dismay, I turned around to find the Manager at the Hotel Desk show me a Rs.10/- note. “Your bill amount was Rs.992/-, By mistake we punched Rs.1000/-. So we return Rs . 10/- to you”. I had goose-bumps then and even now as I write this. The Rs.12/- was kept in my shrine and worshipped regularly . May Baba bless each of you abundantly. 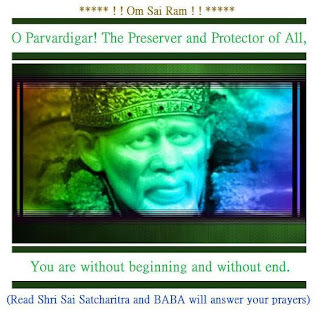 Heartily I thank you for providing and maintaining this wonderful website for all Sai devotees. First time I am going to share my experience. I am very much happy and blessed to do the same. Before I start to share my experience, I would like to tell in brief of how I have become Sai devotee. Also if there is any mistakes kindly pardon me and correct it. Since my childhood there is a big framed photo of SaiBaba in our home. When ever i look at his photo, I used to think how calm and blissful HE is and then will go. Have never prayed to him. In 2010, my parents got that wonderful opportunity of stepping into Shirdi SaiBaba Temple. From there my mother brought me a photo of SaiBaba and gave me. When I saw his photo, I felt that Sai will be with me from now and the same thing happened. Lots of time he guided me in good path. 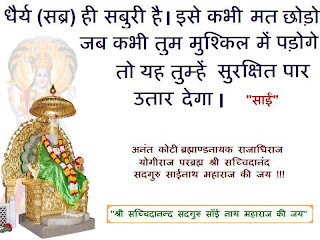 After few months I came to know about Sai Vrath. That time I was an unemployed person. So I prayed to him that if I get job I will do Sai Vrath as per the procedure and he gave me a good position in World's no.2 Company. I was so much happy. But then I was not able to do the vrath. I felt very sad for that and then after few months I got an opportunity to start my vrath and had completed successfully last week thursday. I went to near by Saibaba temple (Coimbatore) gave food to poor people and distributed the SaiVrath books to my friends and neighbours. Now, I would start with my experience. Kindly dont reveal my name or mail-id. As my parents planned to build a new home this is just opposite to our present home, my dad applied for home loan on November. We were told that loan will be sanctioned in a 2 weeks time. So my parents started the building work before the loan has been sanctioned because they planned to fix marriage for me once new home is constructed and hence started earlier without any delay. But then the loan wasn't sanctioned on the said time. What ever my dad had, he invested almost everything for the building work with expecting that loan will be sanctioned today or tomorrow. 3 months gone but no improvement. What ever savings my dad had, he gave everything. This month when he got his salary, he gave every thing. Finally he found that no money is being left out for our daily lives survive. I have never seen my dad's condition so worse. Due to this tension, his health also started to spoil. He did not take food and sleep properly. And last month end, we told to stop the building work until the loan is sanctioned. But the situation was if we stop the work all the material will go waste and building will not be in proper quality. My parents planned to sell the land which they kept for my marriage. As that was the last option. I felt so bad of my parent’s situation. Last week Thursday I forced my dad to come along with me to SaiBaba temple and I prayed to SaiBaba that with in next Thursday the loan must be sanctioned. If it happens I will offer a rose colour shawl to Baba. While I was in the queue I asked Baba that if he had accepted my request, give me my favourite flower. When I went near Sai Idol, poojari gave me the same flower which I asked to Baba. I was so much happy and I thanked Him for his blessings. After that last Sunday, my dad called the land broker and spoke regarding selling it. I was so much upset. 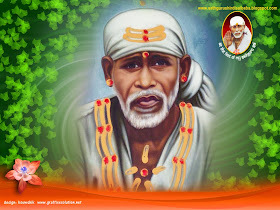 I prayed to SaiBaba again and I got relaxed by thinking about the flower incident. On Tuesday, situation was land was about to sell. After my evening pooja, suddenly my dad got a call from bank stating that the loan has been sanctioned. Until Tuesday the bank manager dint give us any positive hope. Suddenly when he made call and said the news, every one was so much happy and surprised. I went in front of SaiBaba Idol and thanke d him whole heartedly where automatically tears rolled down from my eyes. Then yesterday me and dad went to SaiBaba temple and offered him the rose colour shawl. Out of that huge crowd, that poojari took the big garland from Baba’s neck and gave it to my dad. That time another guy interfered and try to get it but that poojari said, this garland is only for him and gave it to my dad. That was unexpected incident which shows that Baba full heartedly blessed my dad. Really happy and thank you so much Baba. Kindly give your blessings to everyone. Please do not give my name or email. I was in very critical financial state with cheque for shop rent for Rs 3 lakhs having bounced on Saturday 4 feb 2012. I was in very dire strait with not a single rupee and in danger of losing shop as well as facing insult and humiliation. On Tuesday i got call from landlord regarding same. Icould not sleep all night. I prayed to baba for help. On wednesday morning i begged Baba and telephoned my friend for help. He asked for 10-15 minutes time and after about 35 minutes he called me and said that money is arranged. THIS help and arrangement is purely miracle of Baba ad He has saved me from a lot of complications.Thank you Baba.Sairam. I thoroughly enjoyed while reading your experience with our beloved Baba. Your narration is simply awesome. Baba sabki pukar suniyae par apni beti ko mat bhuliaye. Baba please bless me. sorry BABA, my faith is not good enough yet. Please keep me growing at your feet. 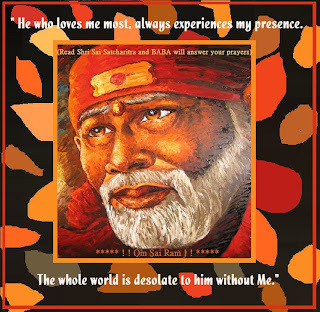 Very nice experience!OM SAI SRI SAI JAI JAI SAI OM SAI SRI SAI JAI JAI SAI OM SAI SRI SAI JAI JAI SAI OM SAI SRI SAI JAI JAI SAI OM SAI SRI SAI JAI JAI SAI!!!!! After Reading your experience i was crying within myself out of happiness and the way baba helped his children. Thank you dear Sai Bhakt. Baba made me narrate HIS story! Am forever grateful to HIM and kind people as you for your very encouraging words! Baba's miracles are endless... !! Thank you dear devotee for your motivating words. Om Sairam!! True prayers are always answered. The govt. Employees experience as well as the other incident(s) of loan truly depicts the same. May Baba bless all. Om Sairam!! All experiences are great and amazing!!! OM SAI SRI SAI JAI JAI SAI!OM SAI SRI SAI JAI JAI SAI!OM SAI SRI SAI JAI JAI SAI! OM SAI SRI SAI JAI JAI SAI!OM SAI SRI SAI JAI JAI SAI!!! Om Sai Ram. May baba bless all. Thank you Manishaji for this platform. This is really inspiring to read such experiences. It gives hope that someday Baba will make things change for good (though I know he can not change everything but what ever he can - that makes me survive or sail through). Like the lady in the first story I am also on the verge of calling it QUITE in life. My responsibilities hold me back. I feel inspired with these stories on your blog it fills in some positiveness and hope. Thank you for all your consistent efforts. May baba bless you and others. Jai Sai Ram. Om sai nathay namah. Om Sai Shree Sai Jai Jai Sai.